From 9 March through 25 June 2017 the Mauritshuis presents Slow Food: Still Lifes of the Golden Age, the first exhibition to be devoted to the development of meal still lifes in Holland and Flanders from 1600 onwards. 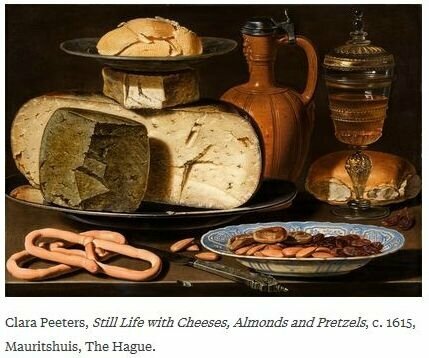 The cornerstone of the exhibition is a masterpiece acquired by the museum in 2012, Still Life with Cheeses, Almonds and Pretzels by Clara Peeters. The exhibition features 22 masterpieces from Washington’s National Gallery of Art, Rijksmuseum Amsterdam, Oxford’s Ashmolean Museum among others including all the works by Peeters from the Museo Nacional del Prado in Madrid.